Digital Media is defined as audiovisual media contents and applications that are distributed directly over the Internet. This includes digital video content, digital music as well as digital games for different devices and electronically published written content. The worldwide revenue of US$150.0 billion in 2018 is expected to grow to US$173.0 billion up to 2023. Note: Worldwide numbers only include countries listed in Statista's DMO. The trends towards smart devices and always being online has highly influenced the Digital Media landscape. Consumers are interested to have access to digital content at any time and at any place they desire. New business models such as streaming services of music or videos contribute to the rising popularity of Digital Media. 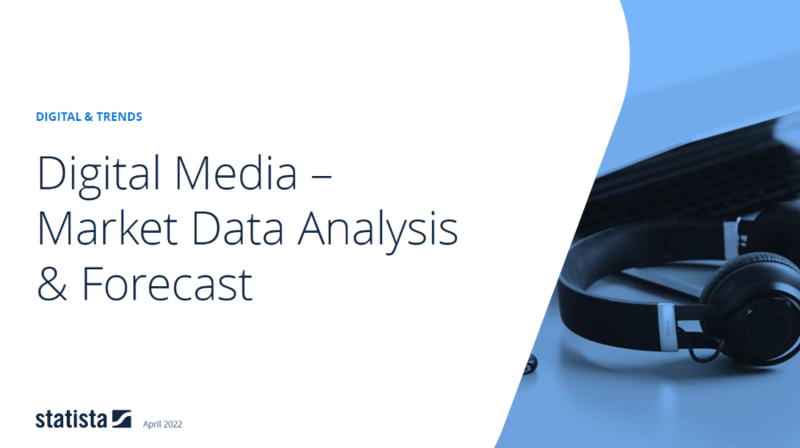 In this report, the Digital Media market is divided into four major segments, covering different products and services: Video Games, Video-on-Demand, ePublishing, and Digital Music. When looking at the three major Digital Media markets, the U.S., China and Europe, the U.S. was the biggest market in 2018 and will be in 2023.